Work pressures are sucking me, I can not breath, city is so congested, traffic situation is so pathetic, I can not take time for myself… Hey dude chill, give me a break…no no no dude you have to take a break from your mundane profile. And there is no other way than travelling out somewhere to Relax, Rejuvenate and Reclaim your inner self. But…But. But…where, how and when are a few hurdles which prevent us from coming out of the vicious circles of our lives. 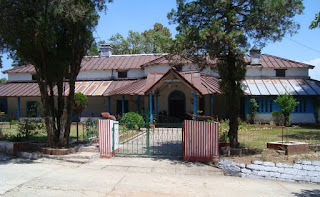 Delhi – Ghaziabad (38 km.) – Meerut (86 km.) – Mawana (115 km.) – Bijnor (154 km. )– Najibabad (190 km.) – Kotdwar (212 km.) – Lansdowne (253 km.). Start early from Delhi in order to escape the chaotic traffic in Meerut. Post Meerut driving is a sheer treat, almost deserted highways gave us abundant time to appreciate the adjoining farms and amazing stretches of cultivating lands. The road is in excellent condition and is a pleasure to drive. Trees planted along the roadside makes the journey more comfortable. Bijnor and Najibabad will pass in a flash and in no time you will be in Elephant park, which is situated at the outskirts of Kotdwar. Park was too tempting to take a break and step out of the car, but "Resist the Temptation". It is very difficult to resist if you only see the Elephant Park, however the moment if you look around you will find a skyline dominated by the hills. That is something seriously very hard to resist. Guys keep on moving, after Kotdwar you will be in the laps of the hills. Take due care in driving as splendid landscapes appearing on either side are worth taking away your concentration, which you cannot afford at all while driving on the hills. 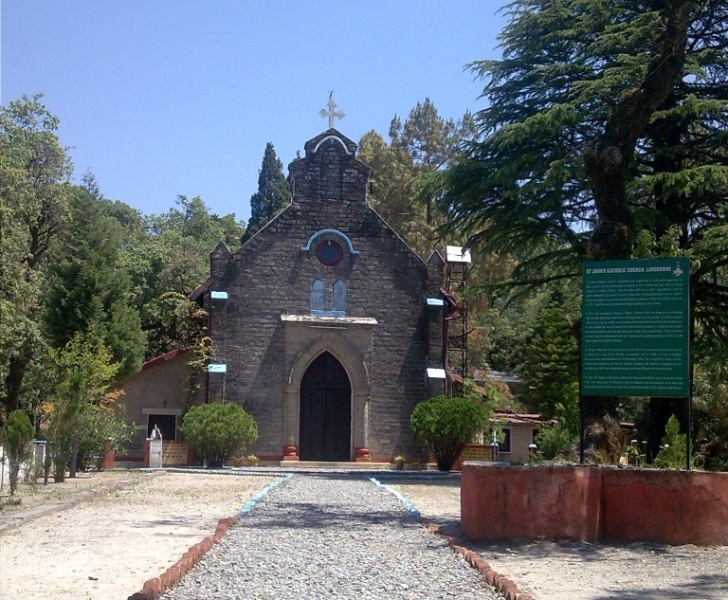 Surrounded by thick oak and blue pine forests, Lansdowne has scenic beauty and excellent surroundings. Situated at an altitude of 5600 ft., it is very charming for a quite holiday as it is devoid of the usual hustle and bustle of hill station. As I always say, “Good Travellers never plan in advance”, keeping consistency with myself I did not booked the hotel in advance. It took us no time in getting a hotel booked for the next two days. However, my sincere advice to all the travellers, please go for advance booking as there are only 3-4 hotels in Lansdowne. All the hotels are usually 100% booked for the weekends. If you arrive on weekend without booking, you will find hotels charging exorbitant prices. By the time we checked in Lunch was already waiting for us. We were dying to go out, this a natural human tendency to compromise on food while travelling. But you should never compromise on food. Once we were through with the lunch, we set out on foot to explore the intrinsic beauty of this place. Apart from the Garhwal Rifles’ settlements, a small market, 2-3 restaurants, a Cineplex and a few hotels make up Lansdowne. Watching the stars is an activity you can indulge here. We were astonished at the number of stars we were seeing; however in Delhi we have to contend with only a few stars at night. You cannot ask for more, if you find the morning being greeted by the Chirping of birds and cool breezes. Well what a morning..? We had whole of the Lansdowne in front of us and to be explored. My car was sitting pretty in the parking zone, as we started on our feet. The first thing to catch the eyes is the exceptional cleanliness and calmness of this place, unlike many other hill stations in India. There is no dearth of such types of passes in the mountains. Are you the game for such an adventurous walk...indulge in something crazy, take my words you will be proud of yourself over the time. This place is Mecca for those who likes to be with themselves. One can sit besides a tree and reclaim his/ her inner self. Lush green trees, cool breeze, serene atmosphere...is something missing? What about a river..? River is also not far from this place. If you have poetic instincts, you will definitely going to thank this place. But, please share with me too whatever you compose. Walking was never more enjoyable, as walking under the umbrella of Pine, Oak and Deodar trees. When the journey is so eventful, who cares about the destination? Step after step, clicks after clicks…landscapes were turning from beautiful to stunning and obviously we were enjoying the good fortune. Take care guys you might run out of camera memory, such is the beauty of this place. Not only the picturesque views, the beautiful resort also serve delicious food. The hotel is operated by Garhwal Mandal Vikas Nigam. It was the time to satiate our taste buds. Contend and recharged we again started our expedition for further. 200m. from Tip-in-Top, there is a Santoshi Mata temple on a hill top. It turned out to be a good decision to leave the car behind to explore this place on foot. A hand on steering wheel and the eyes on the road robs you from the pleasure of enjoying the opulence of nature. You have to walk a lot to enjoy every bit of this beautiful place. Some distance ahead was the St. Mary Church. It was constructed in the year 1895 by Col. Hume of Royal Engineers. Now it is a small museum showcasing pictures from pre-independence era. The church is much visited by historians as well. Next in our diary was the “Bhulla Lake”. Suddenly we decided to leave the road and explore the woods/ forests and the hills. Wanderer was all smiling and relishing the good fortune and the decision of coming to Lansdowne. Devoid of any proper direction we set out to find our way, with our instincts. That’s the way we started on…and very soon we were on the right track. In the process, we saved a lot of time. You can enjoy a quite lunch, pedal the boats, and roam around in the garden. Without wasting time we decided to hit the pedalled boats. Apart from boating, visitors’ friendly Ducks turned out to be the amazing companions for the boat trip. There are some rabbits too in the premises, do not forget to click them. A café run by government in the Bhulla Lake premises sells fresh juices and local handicrafts. One can buy fresh and refreshing “Rhodo dendron” and “Malta fruit” juices from this shop. By the time we returned it was getting dark and the smell of food had already started calling us. There are 2-3 eateries in the Lansdowne main market, so you do not have much option to choose from. However the food served here is pretty economical. Lansdowne is a place where you can go for long walks. Being a seasoned trekker, my trekking kit always has a torch, this time it came handy for a memorable night walk. This is an ideal retreat for the tourists who seek seclusion in mountains. Almost every hill station has a story associated with it. It can be the legend of ghost of some previously living gentlemen/ lady or a myth associated with some haunted house. When we returned back, all of a sudden I noticed one of the pictures, clicked by me during the night time. I distinctly remember that when I was clicking the trees, there was no one coming in view of the camera. What is surprising is the shadow of a boy carrying a bag. As compared to the lady in red dress, the boy is too long. Looks like I have to again go for a ghost hunting trip to Lansdowne. Who's complaining...? Golden Rule - When returning back to home keep some extra time, you might come across something you might have overlooked while going. Adhering to the rules, we started early as we have planned to spend some time in the Elephant Park. However we came for a surprise in a “Durga Temple”, situated roadside on the hills. There was a small cliff coming out from the walls of the hill and the temple was erected right over the top of that cliff. Till now we were clicking the sceneries from the top. Now it was the turn to capture the panorama from the bottom…Getting right to the river bed surrounded by mountains is something out of fiction movies, a small but an amazing Canyon. We were fortunate that we travelled in this season. During rainy or post monsoon seasons, the river would have been out of bounds. Halt at the temple turned out to be the “Icing on the Cake” for our Lansdowne trip. One can easily enjoy an hour or more in the temple. By the time we had realized that we were due for a lunch, we found there were no roadside hotels in the way. We had no option but to keep moving. We finally found a restaurant, in fact a good one. After the lunch there was no stopping for us. We finally stopped at our house, albeit with a lot of sweet memories and moments to cherish forever. It is very difficult to pen down the beauty of Lansdowne in one article. To summarize this trip: Natural beauty is opulent here in Lansdowne. We have enjoyed and always enjoy relaxing here in the hills. Our ancestors have handed over this earth to us with great care, now it our responsibility that our future generations should also get a chance to enjoy the vacations in these places, we owe it to them. "Leave the cars behind, if you can manage by foot. Inviting all the steps in order to PRESERVE the MOTHER EARTH"
nice post.Great pictures. Keep travelling and keep posting about your travels . love reading them. Nice place and of course nice post, which always inspires to take break from busy life and to take break for such a wonderful place. Everytime you are exploring excellent places with nature beauty. Your write up always makes fresh feeling for us about beauty of india. Keep it up and keep posting new articles. This is very good. tell me more information about this. I want to know about this. awe inspiring post! i am excited to leave for this place as soon as i can! Do share your experiences too..
Lansdowne is the nearest hill station to Ghaziabad. Loved it serene beauty. Less popullar among tourists is what I liked most about it. waiting for another chance when I can again visit and relax.